PLAYER VERDICTS: Smith scooped sponsors’ prize, but did he win PT award? Posh right-back Michael Smith wins a header against Scunthorpe. Photo: David Lowndes. Right-back Michael Smith was the sponsors’ man-of-the-match as Peterborough United were beaten 2-0 by League One leaders Scunthorpe United at the ABAX Stadium tonight (November 22). And the Northern Irishman also caught the eye of the Peterborough Telegraph’s man at the match. 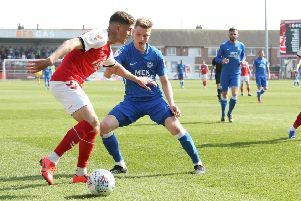 Marcus Maddison on the charge for Posh against Scunthorpe. Photo: Joe Dent/theposh.com. The fact that Posh didn’t play well was emphasised by half-time substitute Gwion Edwards receiving one of the highre marks. Posh striker Tom Nichols is surrounded by Scunthorpe defenders. Photo: David Lowndes.